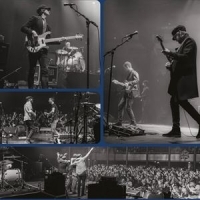 The Rifles are an Indie band formed in Chingford in 2004. Members include Joel Stoker - vocals and guitar, Lucas Crowther - guitar and vocals, Lee Burgess - bass, Kenton Shinn - drums and Dean Mumford - keyboards. Releases include theor 2006 debut album, "No Love Lost", plus: "Great Escape" (2009), "Freedom Run" (2011), "None the Wiser" (2014) and 2016's: "Big Life".